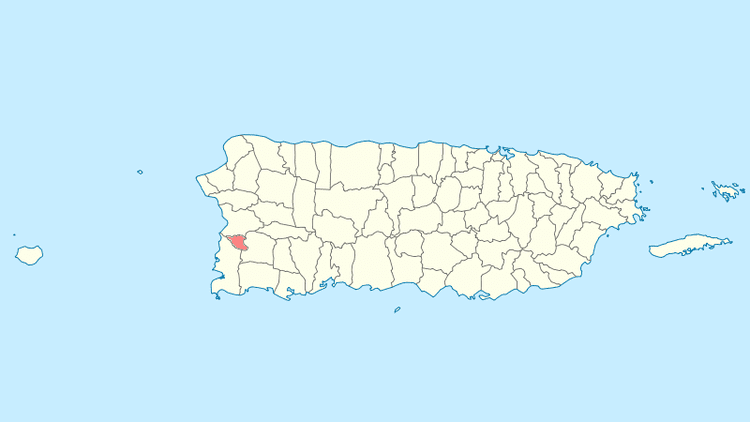 Hormigueros ([ormiˈɣeɾos], Formicaries) is a municipality of Puerto Rico (U.S.) located in the western region of the island, northeast of Cabo Rojo; northwest of San Germán; and south of Mayagüez. Hormigueros is spread over 5 wards and Hormigueros Pueblo (The downtown area and the administrative center of the city). It is part of the Mayagüez Metropolitan Statistical Area. The region of what is now Hormigueros belonged to the Guaynia region, located on the southernwest portion of Puerto Rico. Archaeological findings have established that there were tribes already settled in the region around 820 BC. During the Spanish colonization at the beginning of the 16th century, it is possible that some of them settled in the area. A coffin found underground a basilica was tested in laboratories and was dated prior to 1600. Some historians also mentioned the Horomico river as one of the main sources of gold during the rush of the era. 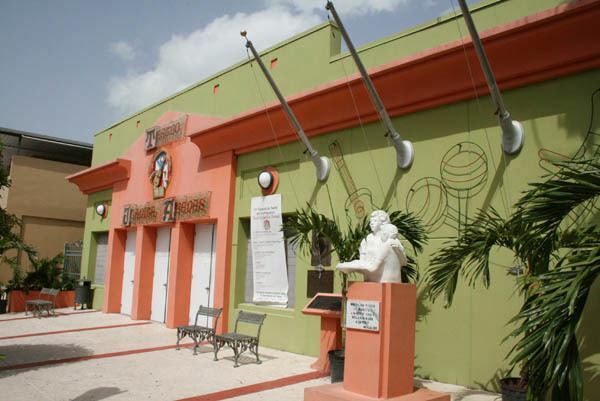 In 1692, the town of Hormigueros was first established, first as a village of Mayagüez. From 1863 to 1873, residents of the area started petitioning for the area to be declared an independent town. In 1874, it was finally granted independence from San Germán. The town's flag is based on the towns shield. It consists of a blue cloth with a horizontal white rhombus. Superposed on the white rhombus is another blue rhombus with a white globe outlined in blue with a cross. The globe with the cross symbolises royalty and represents Christ's domain over the world. This symbol is a traditional attribute to the Virgin of Montserrat. The town's shield is formed by a blue rhombus, with silver-plated edge. On the blue bottom there's a green hill which is a representation of Our Lady of Monserrate de Hormigueros' Sanctuary, with its silver stairway. The border has symmetrical black dots, on guard. On the top of the shield resides a crown formed by a wall, with three towers that have blue doors and windows. The joints of the stones are filled with blue lines. The shield is surrounded by two chains that begin at the crown and finish under the bottom part of the shield with the last links broken. The name of Hormigueros means "anthill" in English. The town possibly derives its name from three concepts. The first one refers to the crowds that gathered at the Basilica Menor on September 8 to honor the Virgin of Montserrat. The second refers to the topographic formation of the town which consists of countless hills resembling "anthills", reason why it was called "Valle del Hormiguero" or "Anthill Valley". Third, it is possible that the name was originated from a Taíno word: Horomico, which means "río de oro" or "river of gold" due to the importance of the rivers in the area during the gold rush of the Spanish colonization. The municipality of Hormigueros can be divided in three areas: the northern mountainous region that covers one fourth of the town, with hills of relative height; a semi-mountainous region that extends from east to west covering downtown Hormigueros; and the flat, valley-like region that extends towards the south covering 5.6 square miles. 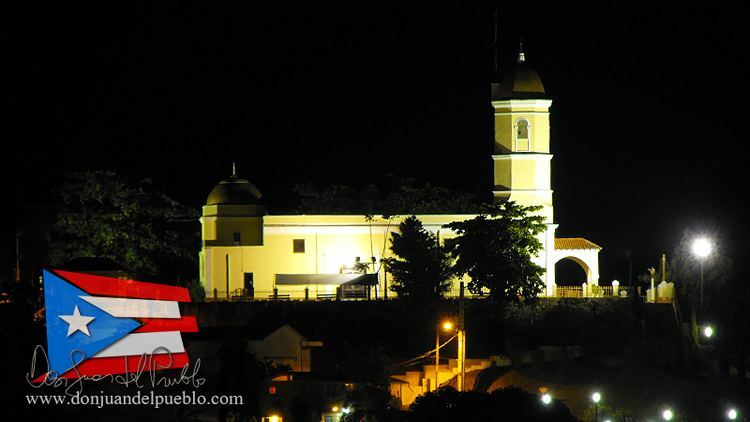 It is the second-smallest Puerto Rican municipality in land area, larger than only Cataño. The climate conditions of Hormigueros are hot and humid. The average temperature is of 72°F to 79°F. The economy of Hormigueros is still developing. In the 1980s and '90s Allergan, Inc. (a pharmaceutical company) had a subsidiary established in town boosting the economic development of Hormigueros. However, after Allergan left no other private industry has opened operations in Hormigueros. On the other hand, Hormigueros does provide abundant land, talent and accessibility for an economic development and expansion. Not far away there are two regional airports: Eugenio María de Hostos Airport at Mayaguez and Mercedita Airport at Ponce. In addition, there is Rafael Hernández International Airport at Aguadilla. All three airports lie within 30 miles approximately. Hormigueros is one of the least populated municipalities of Puerto Rico, perhaps due to its small size. The population, according to the 2000 census, was 16,614 with a population density of 1,510.3 people per square mile (580.9/km²). Since the 1950s, the population has more than doubled. According to the 1950 census, there were 6,916 people living in Hormigueros. Statistics taken from the 2000 census shows that 86.0% of Hormiguereños have Spanish or White origin, 4.9% are black, 0.2% are Amerindian etc. 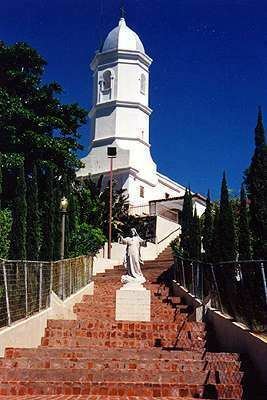 After its initial establishment, Hormigueros belonged to the municipality of Mayagüez. From 1863 to 1873, residents of Hormigueros made formal petitions to be separated from Mayaguez and be declared an independent municipality. They were finally granted their independence as a municipality on April 1, 1874, being its first mayor Narciso Oller Serra. However, after the American invasion of 1898, Hormigueros was annexed this time to the town of Mayaguez. The annexation was ordered by Guy V. Henry, but according to Adolfo de Hostos, it was a town's petition. In 1912, they were granted their independence once again, although there were attempts to annex them again during 1928-29. The city belongs to the Puerto Rico Senatorial district IV, which is represented by two Senators. In 2012, Gilberto Rodríguez and María Teresa González were elected as District Senators. Hormigueros boasts several public and private schools within its territory. 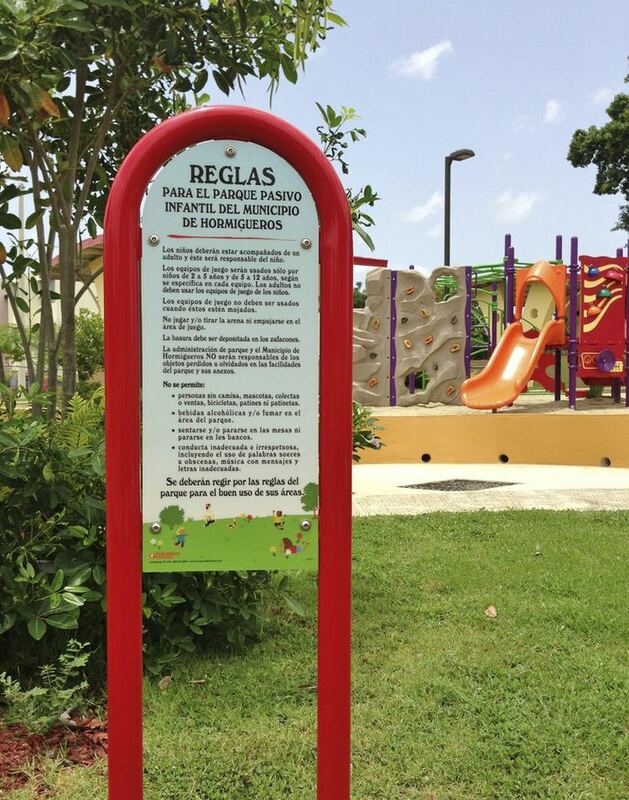 Public education is handled by the Puerto Rico Department of Education. At the same time, most of the population (21-35) has either a bachelor or a higher degree, making the town one of the most talented one in the Island of Puerto Rico. Puerto Rico Highway 2 provides access to Hormigueros from the nearby city of Mayaguez, or from Ponce. The rest of the roads on the town are mostly rural. Like most other towns in the island, it counts with a public transportation system consisting of public cars. Taxis are also available around the town.